← 61. People are Inspirers: Are You Already Crazy Enough? The summer vacation is usually the moment to get some distance from your daily life. You go somewhere with your family or partner, friends or acquaintances and are gloriously away from everything. You leave your routine for what it is and go abroad! There, at your destination, it’s wonderful. You don’t need to do anything. You don’t have to do anything. Days go past without you knowing whether it’s Sunday, Monday or Tuesday. What time is it? Three o’clock already? Then we should have some lunch! Shall we eat outside? Will you grab the fresh rolls? Or shall we eat in the village? What is waiting for you at the end of the vacation? Going on vacation is wonderful. You’ve got weeks ahead of you and the thought of wonderfully relaxing and being lazy is bliss! During your vacation, as the days pass, the journey back starts to come into view. Five days to go, 4 to go, no, only 3 more days, and then it’s once again over. And then comes that golden moment that’s worth taking some time for! Let’s say, you think about home. Back to your place of residence, your home. Back to your work or other activities. What is the first feeling that pops up in you? Is it “Yes! We’re going home!” or is it “No!” with a sick feeling in your abdomen and you want to resist? If you feel the “Yes!”, then I am very happy for you and wish you a wonderful return home! If it’s a “No!”, is it because your vacation was so fantastic or is there more going on? Teachers and caregivers seem to be the people with the most stomach- and intestinal problems. That’s because they have careers in which emotions play a large role. They can be very intense jobs. From my teaching days, I know many teachers who started having nightmares at the end of their summer vacations. They would shoot upright in bed, sweating profusely. Wake up with visions of students or colleagues or entire classes who started revolting. The thought of school made them very nervous inside. How do you think it is for doctors, nurses, prison guards, psychiatric counselors? What does the MIR-Method do with nightmares? One of the effects of the MIR-Method is that it helps to decrease the number of nightmares. That comes through the steps 2, 4, 5, 6 and 7. Note: always do all 9 steps of the MIR-Method! Step 2: “Detox all toxicity”. If you have an excess of toxic substances in your body, it can cause you to have nightmares. This is especially the case when the toxic substances tax your liver or your brains too much. XTC or soft drug users can absorb chemicals that cause nightmares. And what is even more shocking is that synthetic vitamins, meaning vitamins in the form of pills, can also cause nightmares! This is especially well known by vitamin B6 and B12. I experienced this myself — 10 years ago – when a naturopathic practitioner prescribed an enormously high dosage of vitamin B6. Starting the first night, I suddenly had nightmares. When I told him about my nightmares and that I found proof about it on the Internet, he waved it aside as nonsense. I stopped using the B6 and the nightmares immediately stopped. Everything that your subconscious experiences as toxic is disposed of, including toxic memories and traumas. They are slowly but surely erased, using among others, the help of step 7 ‘Fulfill basic needs’. This includes toxic pictures such as film fragments of war scenes from the news or scary scenes from horror films. Are you having nightmares? You should avoid this type of pictures anyway! Step 4: “Clear meridians” has an anti-nightmare effect. That’s because of the liver meridian. When it is disrupted, it can cause disruption in your sleep and cause nightmares. Drinking alcohol and eating ready-to-eat meals usually compounds this effect. You are then ingesting too many additives and (artificial) colors and flavorings that tax your liver. Step 5: “Supplement all shortages” takes care of supplementing your nutrients. When you have a shortage of, for example, the amino acid tryptophan, your body can’t produce enough serotonin, the sleeping hormone, causing you to sleep restlessly. Tryptophan can be found in oats, bananas, dried prunes, milk, tuna, cheese, chicken, turkey, peanuts and chocolate. It’s also found in pumpkin seeds, sesame seeds, sunflower seeds, almonds and lentils! Don’t be surprised if you find yourself craving these foods. Step 6: “Balance hormone system”. It seems that there is a strong connection between disturbances in the hormone system and nightmares. Many women going through menopause suddenly get nightmares. The pituitary gland is in very close contact with the emotion-resolving center in the brain. If you’ve ever had a bad experience, it’s possible that the function of the pituitary gland was disrupted. 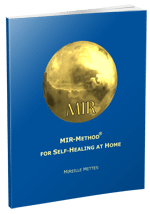 By doing step 6 of the MIR-Method, you get rid of the memories of the bad experience layer for layer and bring the entire hormone system back in balance, even when you’re going through menopause. When you feel deeply insecure, it can cause nightmares. Step 7: “Fulfill basic needs” restores, among other things, the basic needs of “Security” and “Protection”. Why do I still have nightmares? If you continue to have nightmares, it could be that it comes through step 9: “Clarify mission”. It’s related to the “No!” you feel when you think about returning home. As long as you unconsciously hold onto a life that you most profoundly don’t want, your body will make that clear to you. Through nightmares, or by becoming tired or ill. If it takes you too long, you can create a burnout. As long as you continue to expose yourself to situations you don’t want to be in, it costs you too much energy. You use energy, vitamins and minerals, daily make too much cortisol (stress hormone), and in the meanwhile feel fearful, frustrated or sad. Maybe you feel trapped in your situation? And how long do you think you can go on like this? With step 9: “Clarify mission”, you slowly but surely work on changing the situation. And who knows, if you feel the “No!” again, maybe this time you can do something about it! Does this seem familiar to you? What bullets did you bite when you came home from vacation? Please let me know below! Thank you! I wish you a wonderful return home after your vacations, with or without making life-changing decisions! P.S. Help me spread the MIR-Method around the world! Use the icons to the left for Facebook, Twitter and Linked-in. Thank you for forwarding the article! P.S. You don’t know the MIR-Method yet? It’s a free healing method. Go to the home page: www.mirmethod.com Look at the video to understand why it’s free. And look at the complete instruction video. Subscribe to the newsletter and the 6 weeks guidance emails for extra support and understanding of the method!